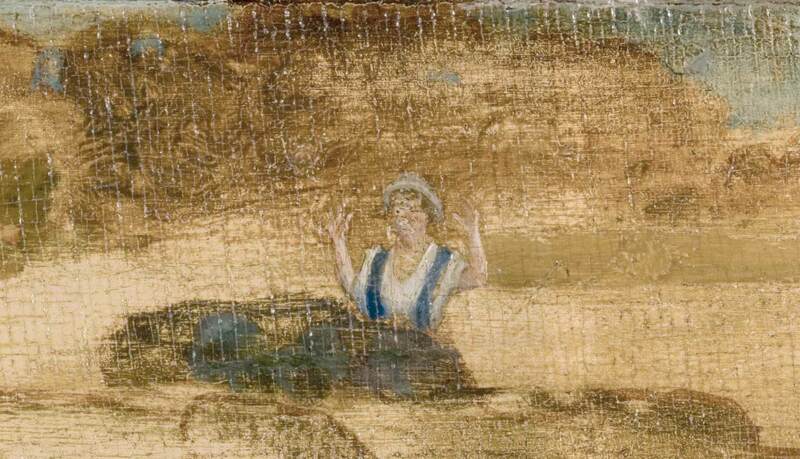 Stunned by the shock of discovering a bare-chested Childe Hassam painting en plein air, Matilda Browne is shown in The Fox Chase with her hands frozen in the air. 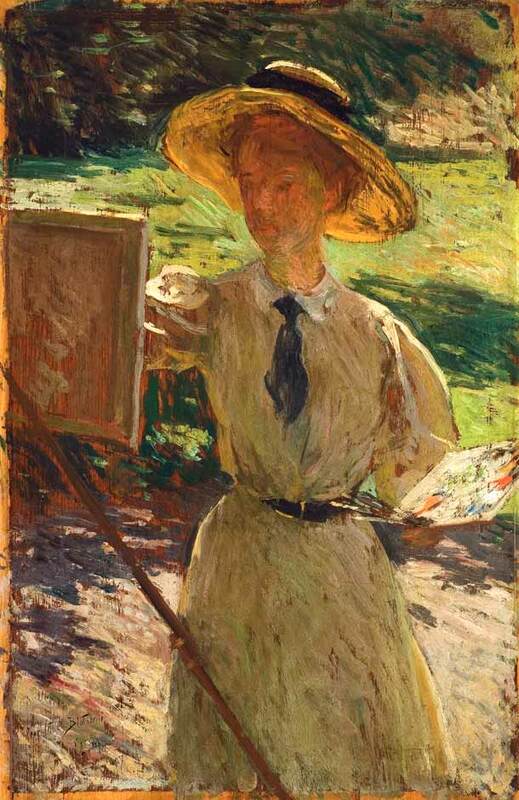 Despite her painted reaction, Browne was probably less affected by the antics of the men of the Lyme Art Colony than most, since she was one of very few women welcomed into their male-dominated art club. Browne began her artistic career when she was nine years old. 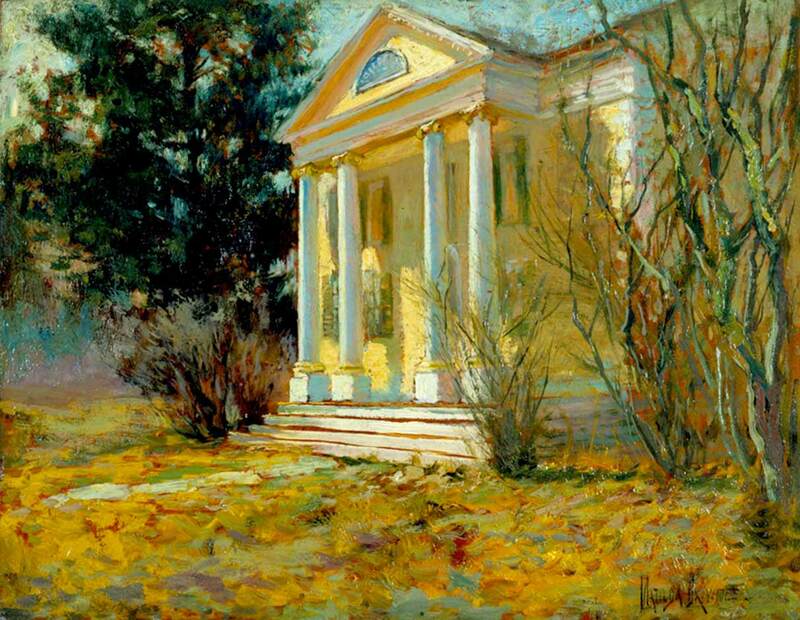 Her neighbor was the famous artist Thomas Moran who allowed her to watch him paint as well as experiment with his art supplies. She was the only female depicted in The Fox Chase, as well as the only female artist to be invited to paint a door or panel for Miss Florence’s house. She painted a scene of calves grazing on the two panels of the door leading to Miss Florence’s bedroom. Indeed, she is the only female portrayed in The Fox Chase, as an artist or otherwise. Even Miss Florence is missing! 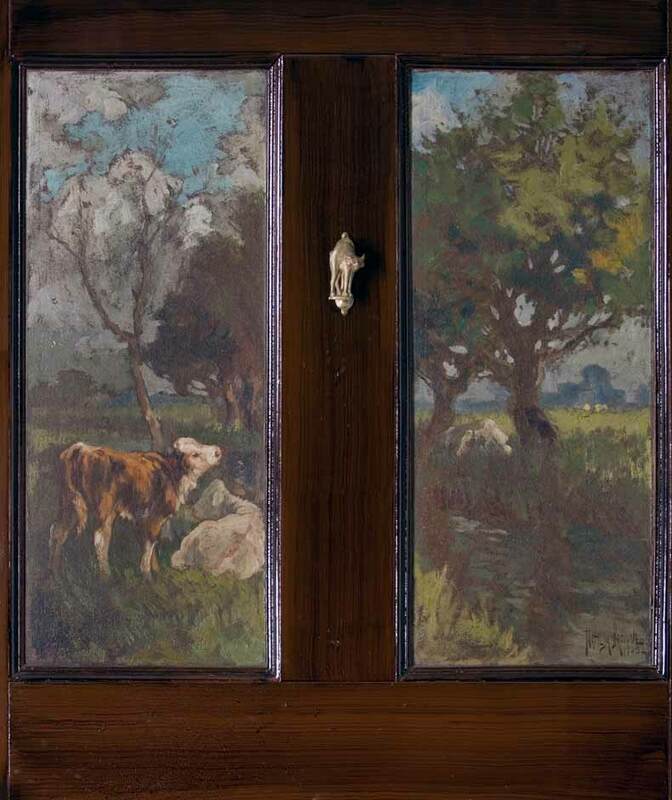 Matilda Browne was also the only female artist to paint on a door in boardinghouse, and she contributed a pair of panels titled Bucolic Landscape (1905), forming a scene of calves grazing beneath a tree, on the door leading to Miss Florence’s bedroom. 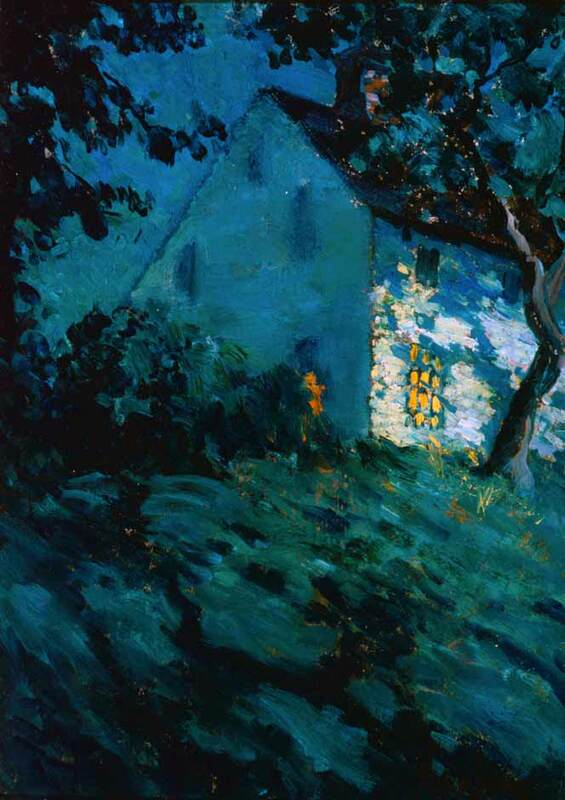 Artistically she was the men’s equal, having trained with masterful artists and garnered an assortment of prestigious awards by the time she came to Lyme in 1905. Moreover, her slight lameness, stout frame, and overall seriousness caused the men to treat her like a sister. 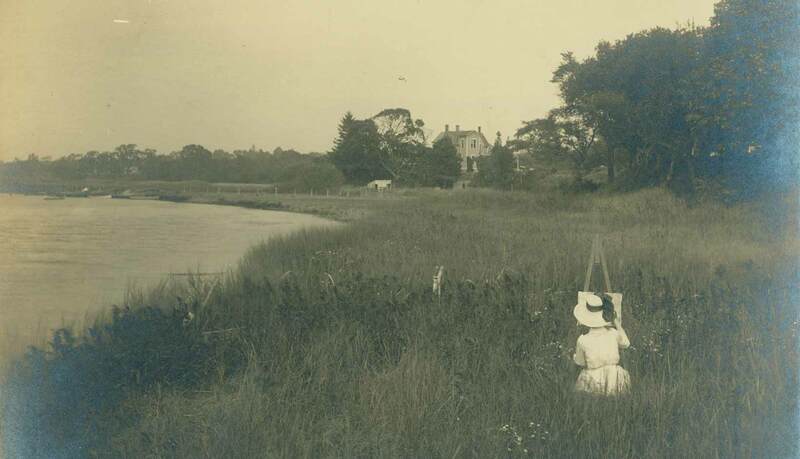 Most of the other female artists who came to Lyme were students that the professional artists felt were not serious. They encouraged Miss Florence not to rent them rooms in the boardinghouse. The artists called these female students “blots on the landscape,” and Willard Metcalf titled his portrait of his art student Lois Wilcox Poor Little Bloticelli (1907), a play of words referencing the Italian Renaissance painter Sandro Botticelli (1445-1510). 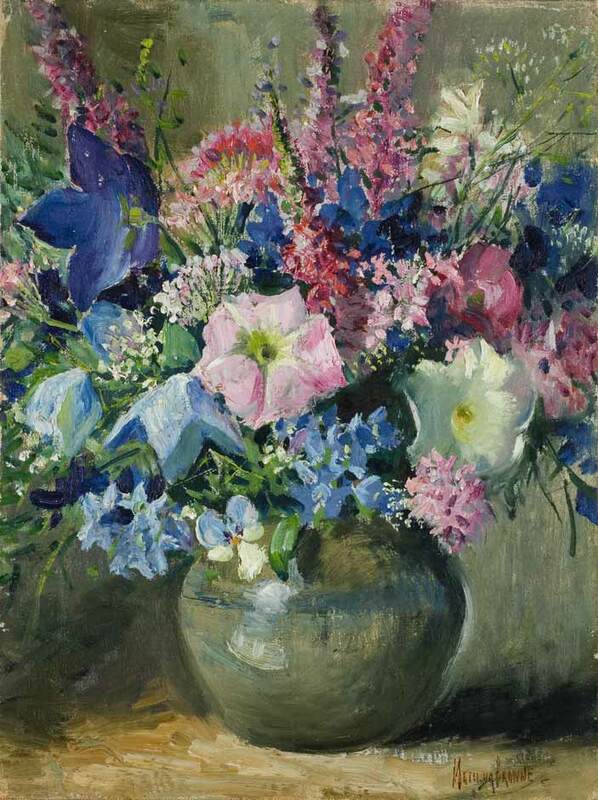 Matilda Browne is one of the best equipped of women painters. She often wields her brush with almost masculine vigor, — her work possesses personal strength and individuality; yet the influence of her distinguished masters is also perceptible. 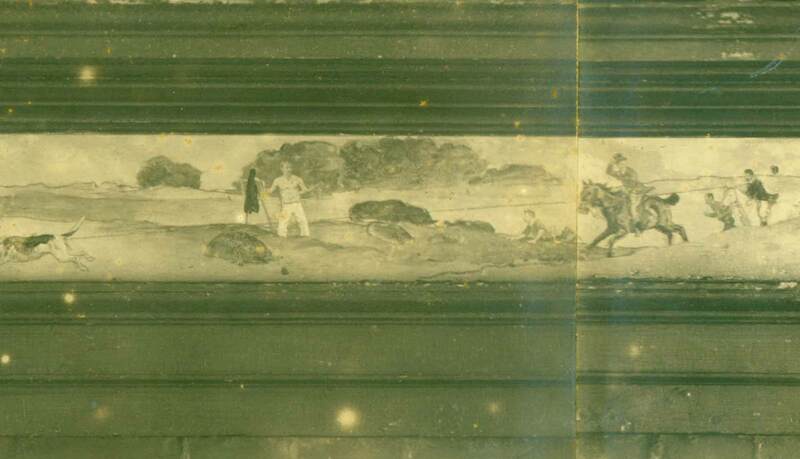 This early photograph reveals minor differences that were part of an earlier version of the Fox Chase image. Notice how Matilda Browne does not appear in this version, but must have been added at a later date. As a child in Newark, New Jersey, Browne was lucky to live next door to the artist Thomas Moran (1837-1926), famous for his large paintings of Yellowstone National Park. He allowed his 9-year old neighbor into his studio to watch him work before inviting her to experiment with paint, brushes and canvas on her own. Her natural talent was obvious. 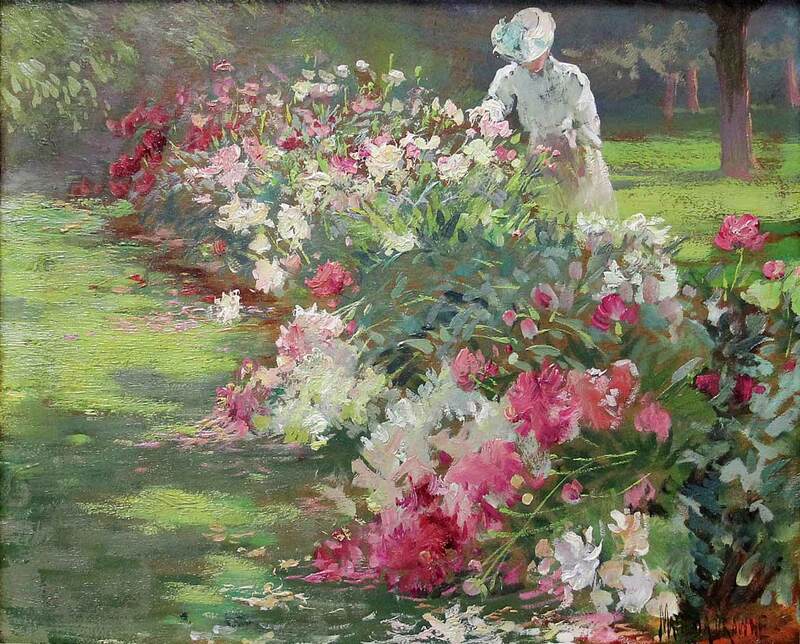 He encouraged her to take additional art lessons, and by age 12 one of her paintings of flowers was accepted into an exhibition at the National Academy of Design in New York. 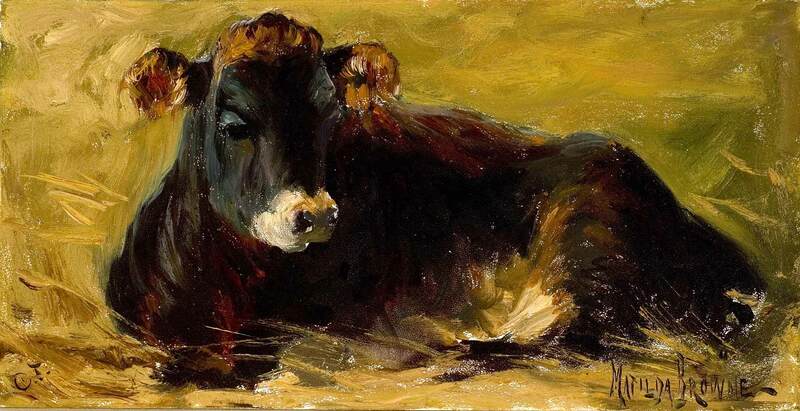 She soon became interested in painting farm animals and traveled with her mother to Europe to study with animal painters in France and Holland. Her mother would buy calves from the local fair to serve as models. When a painting was finished the calf was traded for another. Years earlier Browne had studied with Carlton Wiggins who often painted sheep. It was Wiggins who most likely provided her entrée into the boardinghouse in Old Lyme. She later rented a house on Lyme Street in the center of the village.